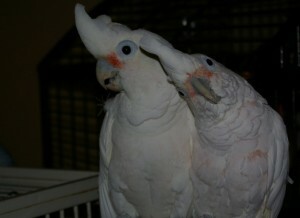 Joco is a 40 – 42 year old Goffins Cockatoo. Due to life changes, his previous owner needed to surrender him – he had lived with the same family for his entire 35 + years. Upon arrival he did have some Vitamin A deficiencies but with a correction in his diet this was changed and he adjusted very well to the proper diet change. 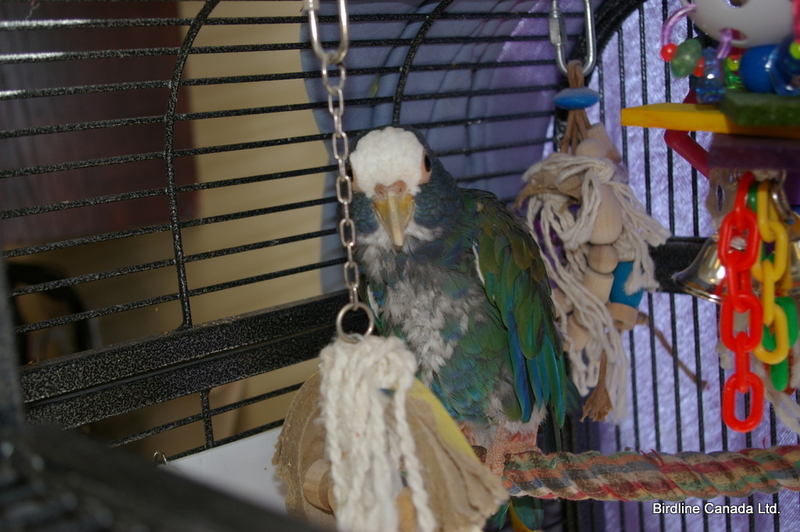 He is very active throughout the day and enjoys chewing wood and LOTS of it, this is something his new family MUST be aware of and provide for him, the wood chewing/playing has stopped him from barbering his feathers and he is NOT a plucker and his feathers remain in pristine condition. 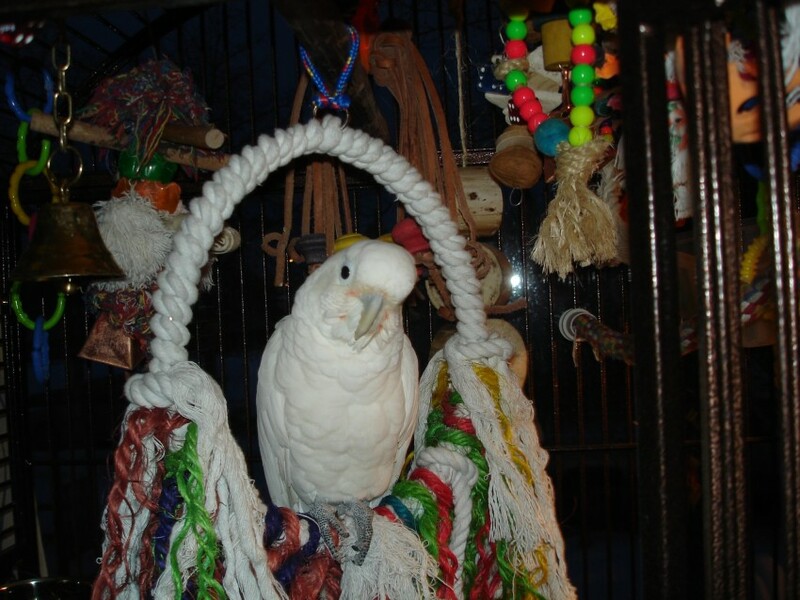 He does need more work with stepping up and will not willingly come off his cage but will allow you to touch him, he loves to wander around on the floor and readily steps up from there. 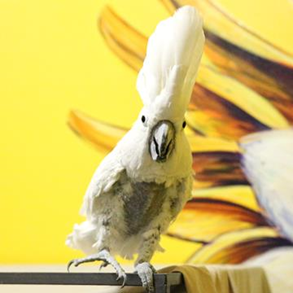 He needs a home with an experienced parrot owner – cockatoo experience would be preferable. Unfortunately the foster to adopt home did not work out for Joco and he has since returned to Birdline, he had been having some excessive screaming fits and we are led to believe he was showing some aggressive behaviors that led to him being returned. He still does not step up very well and has not been actively playing on the floor. Although fully flighted, we had to clip his wings as he was flying to attack a specific person in the home. 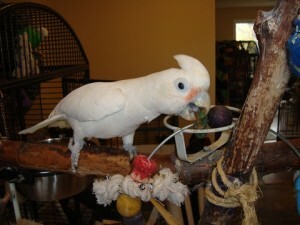 He has learned how to play on a playstand and enjoys wooden beads and rope toys very much. As previously stated, Joco MUST be with an experienced cockatoo owner, while some behaviors have improved, such as the screaming, the aggressive behavior is still being worked on. A loving and patient home is best suited for this beautiful boy. Unfortunately personal issues have erupted in the current home and Joco was unexpectedly brought back to Birdline. We will need some time to assess his current social behaviors before we can determine his placement. This guy has had a hard time settling with one family – we are really hoping his next family may be his last. Please watch for more updates in the coming weeks.